Socioeconomic segregation in educational institutions, residential neighbourhoods, and labour markets has drawn substantial attention from both policymakers and the public in many countries, rich and poor. Concerns about segregation are wide-ranging, from fairness to equity to efficiency, and an underlying current of interest is that segregation at one level (schools, for instance) may perpetuate and amplify segregation at another (universities or labour markets). Though academic discussion of these topics goes back to the 1960s at least, the growth in inequality over the past few decades and the recent rise of populist movements around the globe serve to underscore the continued salience of the issues. Much has been written about the desirability, workings, and consequences of desegregation and affirmative action policies at different levels of education (among many others, see Arcidiacono and Lovenheim 2016, Arcidiacono et al. 2015 for universities; Rivkin and Welch 2006, Lutz 2011 for secondary schools). Much less is known about how policies implemented at one level affect segregation at another. Yet there are evident reasons to study this question – neighbourhoods feed schools, schools feed universities, and universities feed the labour market. Policies implemented at one level affect investment incentives at lower ones and the supply and diversity of human capital for the next (Gall et al. 2015). Nowhere have concerns about desegregation of education influenced actual policies more than in the US. The most far-reaching and controversial has been court-ordered desegregation of high schools (as secondary schools are commonly called there) – since the late 1960s, policies such as ‘busing’ (wherein students are transported to schools that are not local to their homes) have tried to ensure that public high schools reflect the racial composition in the population. Results have been mixed – there is evidence that busing benefits minorities on several dimensions, but also evidence that it contributes to further segregation over the longer run (e.g. Cook and Evans 2000, Guryan 2004, Ashenfelter et al. 2006, Card and Rothstein 2007, Hanushek et al. 2009, Reber 2010, Billings et al. 2014). Partly because of their involuntary nature, they have been met with significant, sometimes violent opposition. Meanwhile, universities, both private and public, have employed various tools to maintain racial diversity on their campuses. Some are informal – admissions committees may seek a diverse student body, without any explicit statement of criteria or methods used to assemble one. Others – such as admission scoring rules that award bonuses to minority applicants, or quota systems that explicitly set aside places for minorities – are more formal and have consequently been more vulnerable to challenge through the legal system. Policymakers and university leaders have subsequently sought creative new ways of achieving university enrolments that are representative of the population. In recent years, several US states, including three of the largest (California, Texas, and Florida) have introduced college admission policies that reward local relative performance – so-called ‘top-N-percent’ laws guarantee university admission to every student who graduates among the top N-percent of students in his high school (by contrast, a traditional admission rule would reward global relative performance, e.g. admit the top N-percent of achievers state-wide). These policies were adopted to replace quota-based affirmative action that had been successfully challenged in court; the expectation was to draw a representative sample of the state-wide high school population, which would guarantee diversity on campus because high schools were highly segregated. As we show in a new paper, these policies afford an interesting opportunity to assess the interactions of policy effects across levels of the educational system (Estevan et al. 2017). Though widely implemented (in 2009, 81% of first year students enrolling at the University of Texas at Austin were admitted under its top-10% plan; see UT OISPA 2010), the top-N policies did not replicate the level of campus diversity seen under the abandoned affirmative action system – representation of minority students on University of Texas flagship campuses, which had dropped by one third after removing affirmative action, was still down by a quarter four years into the new policy (Kain et al. 2005). This failure to restore diversity in admission extends beyond Texas – Long (2004) finds only limited effects of top-N percent laws on campus diversity in California and Florida as well. A possible explanation for this seeming policy ineffectiveness is an arbitrage incentive it creates – under the law, students who fall just short of the admission requirement of being in the top 10% of their current high school class could move to a lower-quality school, where they are more likely to meet the criterion. Indeed, this arbitrage opportunity was not lost on economists after the policy was enacted (Cullen et al. 2013, Cortes and Friedson 2014) and, as we shall see, the evidence indicates that it was not missed by at least some Texans. We take this observation a step further by showing that a neutrality theorem applies – if the private cost of moving across high schools is low enough relative to the benefit of admission to the state university, then the set of students admitted to the university in equilibrium is exactly the same, regardless of whether a top-N-percent policy is in place. This theoretical result provides a stark account of why top-N policies may be ineffective at integrating universities. What is perhaps more surprising is a prediction that the movement of arbitrageurs across schools may have a second unintended consequence – a reduction in the overall level of high school ethnic segregation. We introduce a mixing theorem, which states that school arbitrage must reduce the overall level of ethnic segregation in the high schools (as conventionally measured by such metrics as the mutual information index) if movement is unbiased. Movers are ethnically representative of the high schools they come from, and all ethnic groups within a set of movers from a given school choose target schools in the same way. If, initially, the formation of public high schools follows the basic principles of community sorting models (e.g. Bénabou 1993, Fernandez and Rogerson 2001), wherein parents settle in towns populated by people whose children have similar expected academic achievement, then the conditions for the mixing theorem are likely to be satisfied. Thus, in addition to the explanation for the disappointing performance of the top-N law in maintaining diversity on college campuses, there is a novel prediction – shortly after they were enacted, ethnic/socioeconomic segregation ought to have decreased in states where top-N laws were imposed. The top-N laws may in effect be serving as voluntary school desegregation measures. Of course, as we discuss, the conditions of the theorem may not be satisfied in practice. In terms of the quantity of movement, more realistic assumptions can lead to both less predicted churning because of the policy change (e.g. significant moving costs), but also more (e.g. uncertainty about one's high school class rank at the time one moves), which in turn would dampen or magnify the impact of the policy. And whether movement is unbiased in practice is also an empirical question. This observation is corroborated at the high school and county levels, across time and across cohorts, controlling for various possible confounders such as the introduction of charter schools. 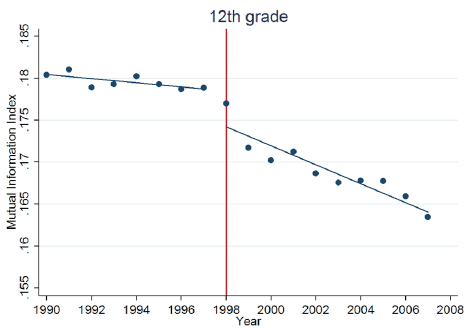 Moreover, after the introduction of the policy, students became more likely to move to schools with fewer college-bound students, lower mean standardised test scores, and fewer Asian and white students (two groups that have higher average academic achievement). In fact, these effects are stronger for students who were not economically disadvantaged and arguably are more likely to benefit from strategic school choice. Thus, a policy intended to achieve desegregation at the college level may actually have achieved it in high schools. The use of university admission policies that reward applicants for local relative performance is spreading beyond the US. For instance, Sciences Po in France has been using affirmative action based on zip codes for years (Sabbagh 2002); the University of Bristol in the UK offers lower entry standards for applicants from lower-performing schools; and since 2013, all Brazilian state universities set aside places for students who come from public schools (Ribeiro 2016). All these policies can be expected to generate some integration at the school or neighbourhood level by inducing some applicants to move. How incentives for students to acquire education at high school and in college can be optimally affected by such policies is an interesting question for future research. Arcidiacono, P and M Lovenheim (2016), “Affirmative action and the quality-fit trade-off,” Journal of Economic Literature 54(1): 1-51. Arcidiacono, P, M Lovenheim and M Zhu (2015), “Affirmative action in undergraduate education”, Annual Review of Economics 7: 487-518. Ashenfelter, O, W J Collins and A Yoon (2006), “Evaluating the role of Brown vs. Board of Education in school equalization, desegregation, and the income of African Americans”, American Law and Economics Review 8: 213-228. Benabou, R (1993), “Workings of a city: Location, education, and production”, Quarterly Journal of Economics 108(3): 619-652. Billings, S B, D J Deming and J Rockoff (2014), “School segregation, educational attainment, and crime: Evidence from the end of busing in Charlotte-Mecklenburg”, Quarterly Journal of Economics 129(1): 435-476. Card, D and J Rothstein (2007), “Racial segregation and the black-white test score gap”, Journal of Public Economics 91: 2158-2184. Cook, M D and W N Evans (2000), “Families or schools? Explaining the convergence in white and black academic performance”, Journal of Labor Economics. Cortes, K E and A I Friedson (2014), “Ranking up by moving out: The effect of the Texas Top 10% Plan on poperty values”, National Tax Journal 67(1): 51-76. Cullen, J B, M C Long and R Reback (2013), “Jockeying for position: Strategic high school choice under Texas' top ten percent plan”, Journal of Public Economics 97: 32-48. Estevan, F, T Gall, P Legros and A F Newman (2017), “College admission and high school integration”, CEPR Discussion Paper DP11910. Fernandez, R and R Rogerson (2001), “Sorting and long-run inequality”, Quarterly Journal of Economics 116(4): 1305-1341. Gall, T, P Legros and A F Newman (2015), "College diversity and investment incentives", CEPR Discussion Paper DP 10337. 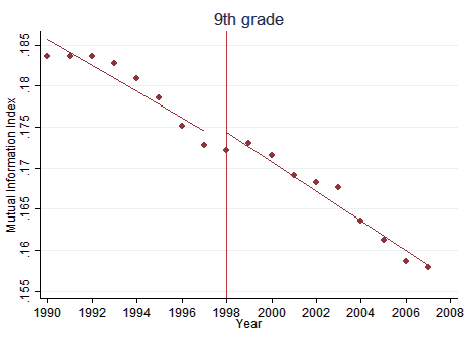 Guryan, J (2004), “Desegregation and black drop-out rates”, American Economic Review 94: 919-943. Hanushek, E A, J F Kain and S G Rivkin (2009), "New evidence about Brown v. Board of Education: The complex effects of school racial composition on achievement", Journal of Labor Economics 27(3). Kain, J F, D M O'Brien and P A Jargowsky (2005), “Hopwood and the Top 10 Percent Law: How they have affected the college enrollment decisions of Texas High School Graduates”, mimeo, University of Texas at Dallas. Long, M C (2004), “Race and college admissions: An alternative to affirmative action?”, Review of Economics and Statistics 86(4): 1020-1033. Lutz, B (2011) "The end of court-ordered desegregation", American Economic Journal: Economic Policy 3(2): 130-168. Reber, S J (2010), “School desegregation and educational attainment for blacks”, Journal of Human Resources 45(4). Ribeiro, A (2016) “Affirmative action outcomes-evidence from a law school in Brazil”, No 2016_43, University of São Paulo (FEA-USP). Rivkin, S and F Welch (2006), "Has school desegregation improved academic and economic outcomes for backs? ", chapter 17 in Handbook of the Economics of Education, Elsevier. Sabbagh, D (2002), “Affirmative action at Sciences Po”, French Politics, Culture & Society 20(3): 52-64. UT OISPA (2010), “Facts and trends 2010”, University of Texas Office of Institutional Studies and Policy Analysis, University of Texas System, Austin, TX, USA.